Av, Puerto Deportivo 1, 30880 Aguilas, Spanien. 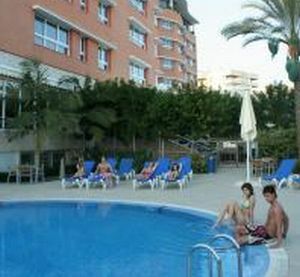 Puerto Juan Montiel Hotel is located in front of the Marina Juan Montiel, nearby the Mediterranean Sea, in Águilas, locality of Murcia, a privileged place of the Warm Coast (Costa Cálida) of Murcia, which has 34 natural coves, rich sea bottoms, 3200 sunny hours and 25°C of average temperature, recreating a natural atmosphere full of charm. It has 128 rooms. Single, Double, Double with Lounge (hydro massage bathtub and King-size bed) and Suites with 1, 2 and 3 Bedrooms (hydro massage bathtub). All of them are equipped with satellite TV, free Internet connection, Wi-Fi in the communal areas, radio, telephone, airconditioning/heating, hairdryer, cosmetic mirror, mini bar, safe box. It also has catering areas, buffet restaurant, bar, lounges and meeting rooms for any kind of events, celebrations and congresses, heated indoor pool in the winter, outdoor pool, anti stress and beauty treatments, relaxing massages, fitness room etc. 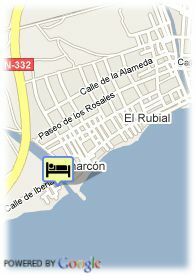 The Marina is settled in front of the hotel, finishing the large range of services and water offer, as well. Bezahltes überdachter Parkplätze beim Hotel.